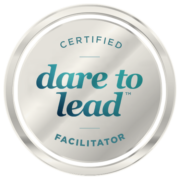 An empirically-based courage building programme for organisations who believe in leadership at every level. Data that supports Dare To Lead is a combination of 20 years of ground-breaking research by Dr Brené Brown into courage, vulnerability, empathy and shame, and 7 years of interviews with 150 global leaders across disciplines from Special Forces to Pixar, non-profits, and Oil and Gas. Rumbling with Vulnerability – Facing risk, uncertainty and emotional exposure with courage and clarity. Living into Our Values – Identifying, operationalising and practising the beliefs that we hold most important. Braving Trust – Creating or deepening connections in relationships and teams based on the seven elements of trust. Learning to Rise – Learning and growing from the failures, setbacks, and disappointments that are inevitable when we are brave with our lives. Identify which opinions really matter and which are coming from the ‘cheap seats’. We deliver the programme in-person and to a minimum group size of 10, over 2 days either consecutive or split. We combine this programme with individual and group coaching to provide accountability and support in embedding the learning and ongoing connection between participants. Content is also available as keynotes and bitesize workshops e.g. Overcoming Perfectionism.